Here’s a tip that might save you from some sadness further down the road: don’t go cheap on the photography. If you’re set to get married soon and are in the process of planning for the big day, here’s a tip that might save you from some sadness further down the road: don’t go cheap on the photography if you can help it. It turns out that spending too little on photography is one of the biggest regrets brides have after their wedding, while spending too much rarely causes remorse. One of the Biggest Wedding Mistakes brides make is not spending enough on their photographer and spending too much on flowers. 21% of Brides wished they had spent more on their photos. With constant access to beautiful wedding imagery — thanks Pinterest and wedding blogs — brides often say they wish they could re-do their weddings. In a survey for their forthcoming wedding issue, New York magazine asked 100 recent brides what’s on their do-over wish lists (and what they would never want to change). Check out the infographic below to see their answers, then tell us: what would you have done differently on your Big Day? 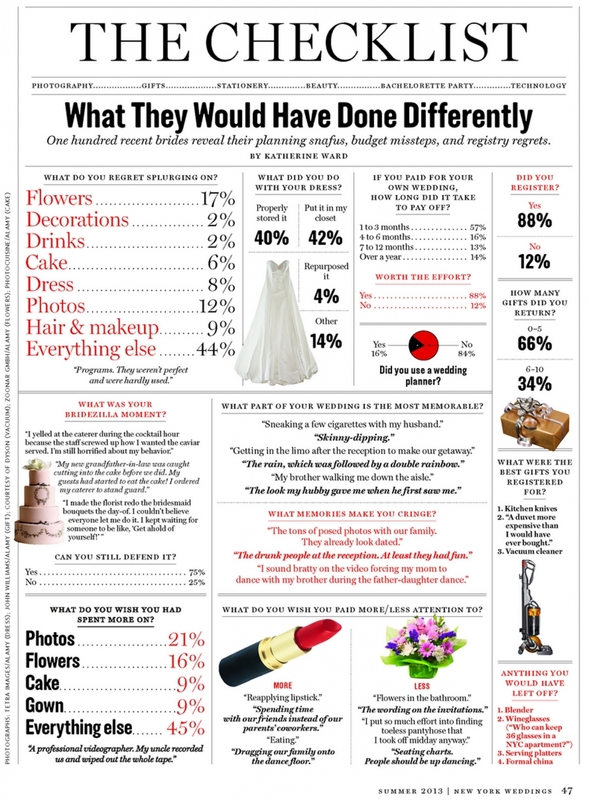 For a wedding issue that will soon be hitting newsstands, New York Magazine created an infographic titled “What They Would Have Done Differently.” The magazine asked one hundred recent brides about what they’d do differently if they could go back in time. As you can see from the two polls above, photography is huge on most brides’ lists.21% of those polled wished they had spent more money on their wedding photography. Only 12% wished they had spent less. If you think the sample size is too small, or that the results don’t reflect reality, get this: Shutterfly found the exact same thing when it polled 500 recent brides back in 2011. They too found that 21% of brides wished they had spent more on photography. All this just goes to show that while many of the things that happen at a wedding won’t be remembered in the long run, photos and videos that result can have a big impact on memories and happiness for many years to come. One of the biggest wedding mistakes that 17% of brides surveyed made is spending too much on flowers. Consider sustainable plants. I had once photographed a lovely wedding at Casa Romantica in San Clemente where the bride used all succulents instead of flowers. A couple of years later I was invited to their home in Redondo Beach to photograph their newborn baby boy and was delighted to see their wedding succulents displayed throughout their home as a living reminder of their wedding day. Pauline Parry of Good Gracious! Events says cocktail weddings will be popular this year. At a cocktail wedding, there is no formal sit-down dinner or buffet, but rather trays of food passed throughout the event. “It’s a complete meal on a small plate, but you’re grazing throughout the night,” she said. “It doesn’t disrupt the speeches or dancing!” Great way to save money and put it towards your dream house. This is more of an anti-trend, but David Pressman of David Pressman Events says that many of 2013’s couples are rejecting the vintage trend of the past several years. “I see less and less vintage now,” Pressman said. “Bales of hay, mason jars — they’ve been done.” Oh yeah and the couch in the field too. Sources: Peta Pixel, Huffington Post, New York Magazine. 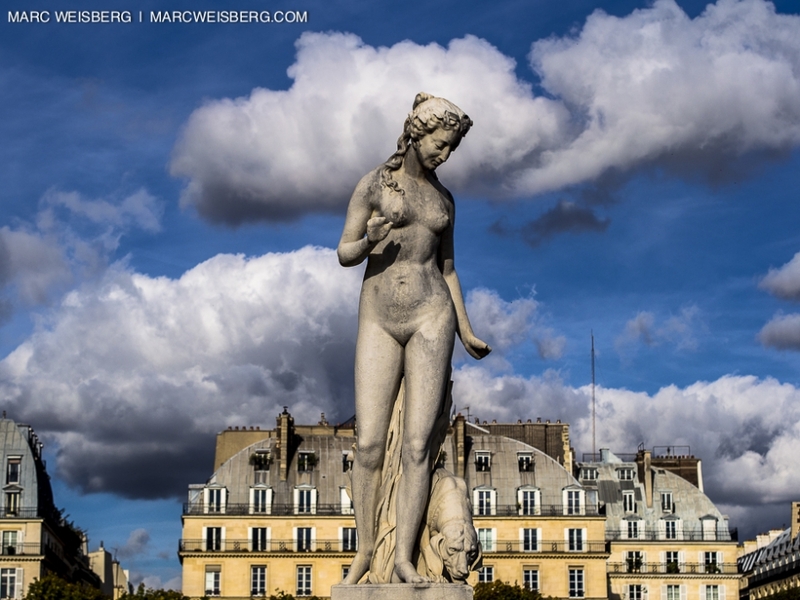 Recently I was going through a few thousand travel photogarphy images from Paris, NYC, Stockholm, California , culling, arranging and doing post production in Adobe Lightroom 4. The images in the post represent a small fraction of my stock portfolio but these stuck out as some of my favorite travel images to post this week. The process took about 2 weeks because I was working on everything that I had photographed in the last twelve years. It was a huge undertaking that needed to be done. Both for myself and for submitting images to stock companies. After promising myself for years that I’d submit to Getty Images and Corbis Images, only to put it off because my work was not cataloged, all the primary work is done. The bigger task will be key wording all the images which will probably take a month or two. So yesterday, I finally made the jump and submitted to both Getty Images and Corbis. So here’s the rub. Some of my friends think that Getty Images and Corbis are evil. While its true that both stock agencies are 800 pound gorillas and their contract are comprehensive and that they are back by a deep pocketed agencies with huge legal teams. The thing is that I have allot of wonderful images that are just sitting on drives and want to monetize them. I’ll keep you posted on the journey.